For the next two weeks, the eyes of the sporting world will be on PyeongChang, South Korea and the 23rd Winter Olympic Games. But in the United States, some eyes will be more focused than others. Not everyone has the same level of interest in this year’s winter games, according to Gallup — at least as the games begin. First off, the data show a clear divide depending on age. Young Americans say they are not as interested in tuning into the winter Olympics as their older compatriots, and the age of 50 looks like an important divider. Among those under 50, only about 30 percent say they plan on watching “a great deal” or “fair amount” of the games. But among those 50 and over, the numbers jump by more than 10 points. Why the difference? Some of it may be attributable to how different generations see and manage their time. Younger people may feel they would rather be out and about in the evening. Besides, if anything truly monumental happens they can always watch the highlights on their smartphones or tablets. The Gallup poll found those younger people were much more likely to say they plan to “stream” the Olympics. Older Americans, meanwhile, may be more comfortable curling up in front of the TV on a cold night. They may also have stronger memories and experiences of past games when the Olympics were more of a singular event that dominated the media. The data suggest the event’s hold on them may be stronger. Even within that age gap, there is also a strong gender split on who’s planning to watch, according to Gallup. Women over 50 are much more likely to plan to watch “a great deal” or “fair amount” of the games (52 percent say that), than men in that age group (43 percent). Strangely, that 9-point gender gap does not appear with Americans under the age 50, where men and women are more even on their plans to watch. Some of this, again, may have to do with memories of Olympics past. Back when the Olympics dominated the news media, U.S. women figure skaters often were the faces of the quadrennial events, known by their first names. Remember Tonya and Nancy? The red/blue political divide, apparent in so many parts of American life, can also be seen in the Olympic numbers, though the difference is less pronounced. Self-described conservatives say they are slightly less interested in the Winter Olympics than self-described liberals. Among conservatives, 37 percent say they plan to watch “a great deal” or “fair amount” of the games. Among liberals, the figure is 40 percent. That’s not much of a split, considering the fragmented state of the nation’s politics. But other data suggest there may be a larger disparity in what Red and Blue America end up watching. Data from the consumer research firm Simmons finds that liberals and conservatives don’t favor the same winter sports. Self-described liberals are more likely to go skiing or skating than conservatives. And conservatives are far more likely to go target shooting. Yes, you read that right, target shooting. 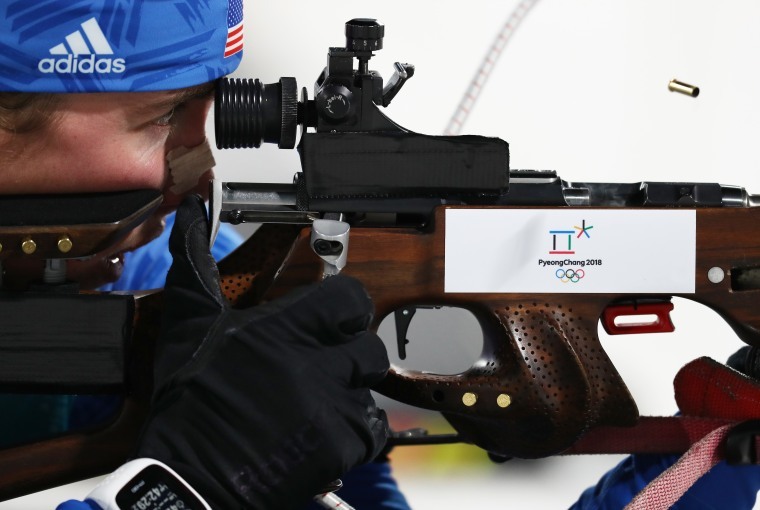 While you might not think of it as a winter sport, target shooting is an important part of one of the Winter Olympics’ most curious events, the biathlon. The Scandinavian sport combines intense cross-country skiing with occasional stops where competitors must get the rifles off their backs, steady themselves, and hit targets set up across the snowy trail. Skiing? Shooting? Voila! Finally, a sport that can unite red and blue America, at least for these next two weeks. Alas, there is one potential stumbling block to national, biathlon-based political moment. The biathlon is the only current Winter Olympic sport in which the United States has never won a medal.